The Pakistan People’s Party (PPP) on Friday announced boycott of the July 30 presidential poll, fully backed by allies Awami National Party (ANP), Pakistan Muslim League-Quaid (PML-Q) and Balochistan National Party-Awami (BNP-A), who also announced staying away from the controversial polls. A one-on-one contest is expected following the Pakistan Tehreek-e-Insaf (PTI) decision to contest the election. Jamaat-e-Islami has also decided to put its weight behind the PTI nominee, Justice (r) Wajihuddin Ahmed. Earlier, twenty-four candidates had applied to stand in the vote, although the election of Mamnoon Hussain, the candidate for the ruling Pakistan Muslim League-Nawaz (PML-N), is considered a foregone conclusion if the opposition stands divided over the boycott. However, some experts see the PPP move of leaving the field open as a covert support to the PML-N nominee in a bid to return the favour, as the PML-N did the same in 2008 presidential elections. PPP’s Ayaz Soomro, informed the chief election commissioner in writing about the party’s decision to boycott the presidential election. At a joint press conference, PPP candidate for the presidential election Mian Raza Rabbani announced to boycott the presidential election to protest against the rescheduling of polling day from August 6 to July 30. Rabbani expressed concern over the Supreme Court’s decision of rescheduling the election, stating that the ECP was an independent body who had earlier twice rejected the PML-N request for rescheduling the election, but the court had come to rescue the ruling party. Rabbani said the ECP had fixed August 6 for the presidential polls exercising its powers under Article 41 of the constitution. He said the move by the Supreme Court and the ECP may be seen a move towards “one unit”, which he considered dangerous. Rabbani said the decision was made in protest to the meddling into the jurisdiction of the ECP on behest of the ruling party. He said the PPP seriously participated in the election campaign and contacted all opposition parties, adding that his party also made efforts for fielding a joint candidate from opposition parties as well. “But we have been left with no alternative but to boycott the election,” said Senator Raza Rabbani, adding that the Supreme Court did not issue any notice, nor did they hear the PPP or did it provide it an opportunity to present its point of view, “rather a unilateral decision was made”. “We see it is part of moves to impose the Centre’s rule again,” he asserted. Rabbani said that the Supreme Court decision made it difficult for him and other opposition candidates to campaign in four provincial capitals and the federal capital Islamabad in just two days’ time. He said they hoped the Election Commission would function independently after the 18th Amendment as it was the ECP’s responsibility to announce the election schedule and hold the polls. The PPP leader said the party’s decision to boycott the presidential election was a part of their struggle against military and civilian dictatorship. He expressed gratitude to all the political parties for their support and guidance during the presidential election campaign and acknowledged the support provided by the masses. PPPP President Makhdoom Amin Faheem said it was an important day and the party had decided to separate itself from the presidential polls after holding consultation with other parties. Aitzaz Ahsan alleged that the Supreme Court, ECP and the PML-N had decided the matter without hearing the other parties. “The Supreme Court has dictated the election schedule to the Election Commission,” he contended. Aitzaz added that the PML-N was afraid of the election campaign of Mian Raza Rabbani and had taken the measures to avoid defeat. 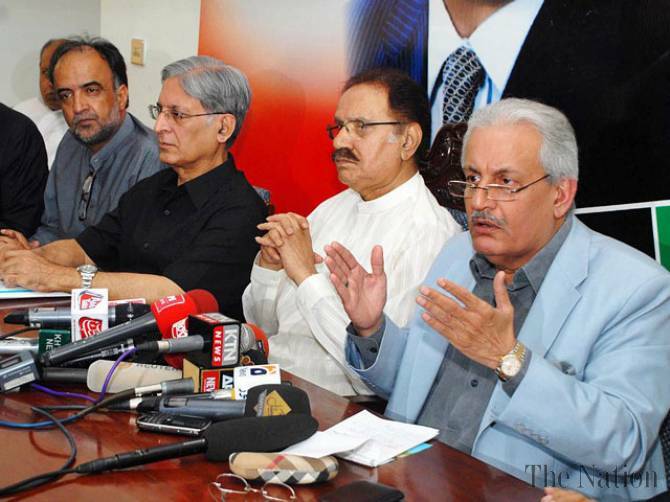 PML-Q, ANP and BNP also announced a boycott of the presidential poll. ANP senior vice president said his party had already announced that it would support any decision taken by the PPP. PML-Q chief Chaudhry Shujaat Hussain told Pakistan Today that his party had also decided to boycott the election. He said the PPP had come to the conclusion with logical arguments and evidence for the same had been shared with him. Preoccupied with point scoring, PPP has damaged Pakistan by boycotting the election of the President. Raza Rabbani is a light-weight. PPPP had read what is written on the wall. If PPP was serious about its victory it should have fielded Asif Zardari, the way it did in 2008, and not Raza Rabbai-who was not even granted a ministerial slot during the PPP's tenure. Gone are the days when the Bhuttos were fooling & looting the nation. You can fool some of the people some of the time, but not all of the people all the time. PPP AND CO.IS THE GANG OF THIEVES.THEY LOOTED THE COUNTRY AND BROKE THE COUNTRY IN 1971 BY WRONG AND SENTIMENTAL POLICIES OF LATE ZAB OF PPP AND WHY PPP IS TALKING TOO MUCH AND PEOPLE HAVE SEEN THEIR PERFORMANCE FROM 20118 TO 2013.BE AWARE OF PPP. The statement that PPP is repaying favor it received from PML-N in 2008 is factually incorrect. In 2008, PML-N fielded Saeeduzzaman as their Presidential candidate who lost. So, this notion of any favor being repaid is incorrect. It had really become impossible for PPP to contest election against PML-N which has unflinching support of SC & ECP. Mamnoon is unanimous candidate of PML-N, SC & ECP. This is called muk muka. PPP took their turn looting the country, now its noora's turn. God bless this country. Blind people cannot see the writing on the wall! Only PTI trolls and their PPP masters have great trouble when MQM sides with PMLN, rather than with these losers. Both PPP and PTI have remained in alliance with MQM for their own purpose and then discarded it. PPP completed its 5 years tenure mostly with the help of MQM. Even now PPP has offered MQM to join Sindh Government. During his General Pasha sponsored jalsa at Karachi on 25th December 2011, Imran Khan never uttered even a single word against MQM or against law & order situation in Karachi. PTI remained in romance till May 2013 when PTI's Lifetime Chairman Imran Khan broke the deal and started throwing venom at MQM. Grapes are Sour for PPPPTI. This game shows that political game is still in hands of powerful military.They are forcing PML to give support of dying mqm this way by giving them ministries.They want to abandon them PPP and give space to MQM.This might be done to put pressure on UK govt who is in mood of grilling Altaf hussain.But establishment knows that Altaf hussain wont tolerate this pressure on his tiny mind and huge structure.sooner He will give the details of Pakistani masked men who are supporting him for so much long time to control Karachi in his ways.So PML who not once but many times recorded their statements against MQM, is now being bound to accommodate MQM with them.On papers.PML dont need this support but who need them is now planning like that for their help as friend indeed of MQM.